We have all the products you need for steaming crabs or making delicious crab dishes. 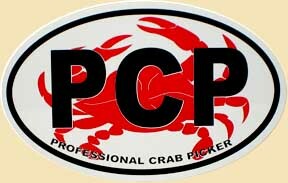 Crab Seasoning, Crab Mallets, Crab Paper, Crab Knives, Crab Cakes, Crab Imperial, Crab Dip, Crab Soup and More! 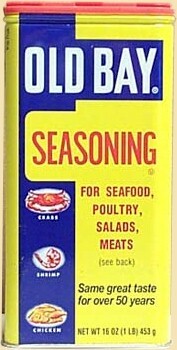 This seasoning is usually used for steaming crabs only because of the large flake salt. It's not a crab feast if you don't have a mallet! 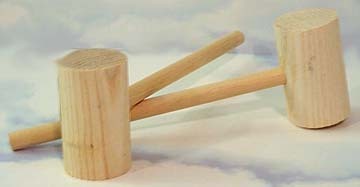 These plain wooden mallets are the tool of choice for crab eaters all over Maryland. 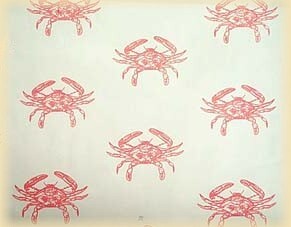 This unique paper with a crab design can be used to cover a table for crab feasts or other seafood feasts. It's great for any picnic or cookout! 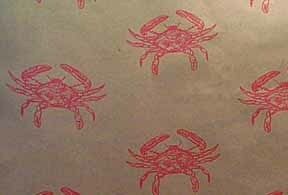 Brown colored paper with printed red crabs. 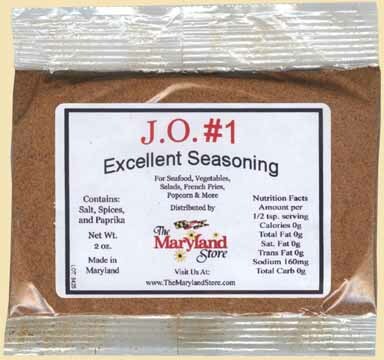 From the heart of Chesapeake Bay country, the famous Wye River Seasoning is an Eastern Shore tradition. Inspired by the Wye River area this seasoning is used on all types of food from steamed crabs and fried chicken to salads. It makes great Bloody Marys! This seasoning does it all! 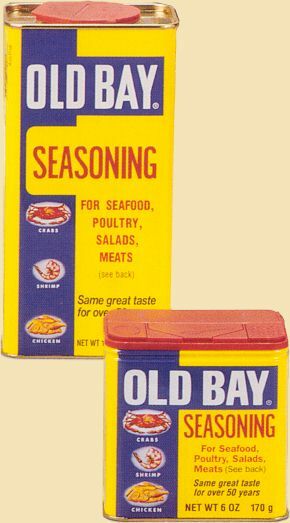 Another classic Chesapeake Bay blend that's been around for decades. Contains salt, black pepper, celery seed, paprika, mustard flour, spices and red pepper. Glass bottle. Mick has created an excellent rendition of the soup Marylanders crave. Using only the finest ingredients, this rich gourmet version will add elegance to your next meal. This soup is an excellent base for vegetable crab soup. Once you taste it you'll be hooked! Also makes a great dip. A #1 seller!! Large size 51oz. cans are normally available in our Westminster store. Call 1-888-284-8565 for information on our current stock or for a shipping quote. A fantastic gift idea! A bouquet of crab mallets! 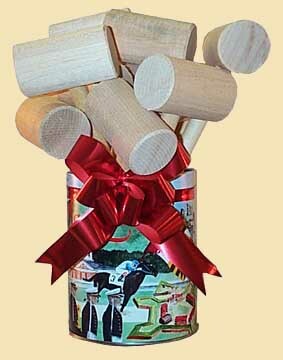 One dozen standard wood crab mallets inside a Maryland scenes lithographed tin, packed bouquet style with a bow. The tin of mallets would be great at your next crab feast! Grab a mallet and start pickin'! 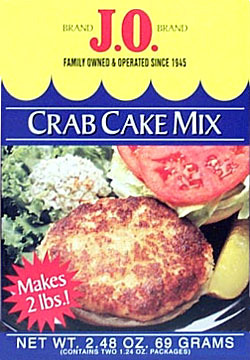 For a real Maryland style crab cake, try this easy to use mix. This is simply the best tasting crab cake mix we've ever tried. Once you've used this mix you'll forget about all those time consuming, complicated recipes. Each box makes 2 lbs. of crab cakes. 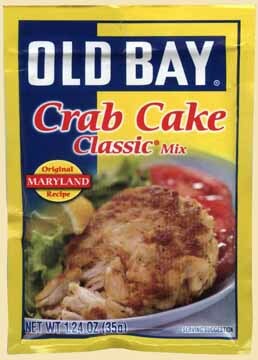 The original Maryland recipe Crab Cake Mix! 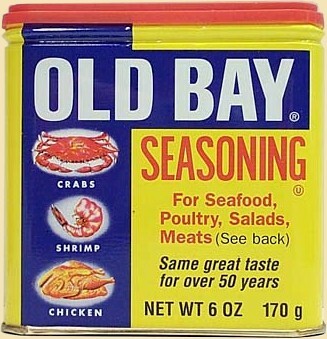 Old Bay gives you everything you need to make perfect Maryland style crab cakes. Just mix this package with mayonnaise and 1 lb. crab meat, shape into patties, then broil or panfry. What an easy and convenient way to make a Chesapeake Bay classic dish. 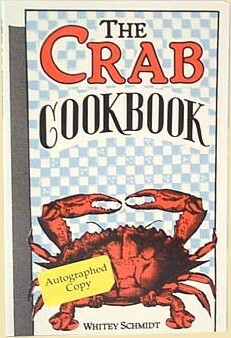 You also get directions for making great Crab Imperial! Now you can make delicious Eastern Shore style Crab Cakes with the famous Wye River brand of seasonings. Easy and convenient, just add mayonnaise and 1 lb. 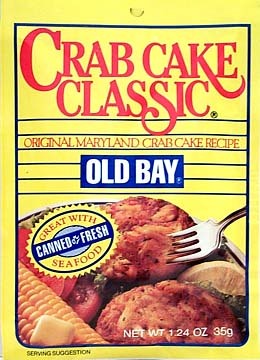 of crab meat for classic Chesapeake Bay crab cakes. 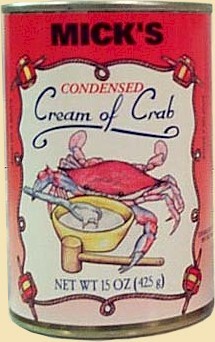 Crab Imperial is a long time Maryland tradition. Now from the heart of the Chesapeake Bay, Wye River makes it easy and convenient to make this classic dish! Just add a few ingredients like butter, milk, mayonnaise, and egg and this seasoning to 1 lb. of crab meat and bake. In 15 minutes you'll have a delicious Eastern Shore style Imperial second to none! Makes 9 servings, 1/2 cup each. 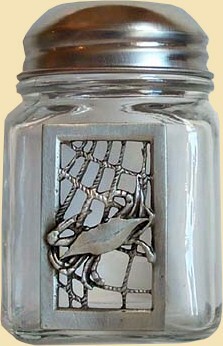 This seasoning/spice shaker has a pewter medallion on the front featuring a crab in a net. Glass shaker bottle with screw metal top. Large holes in the top for easy shaking. 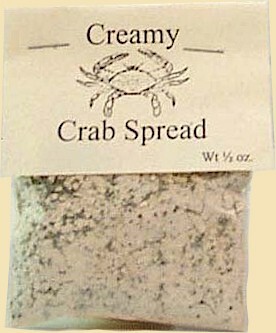 Great for crab seasonings, grated cheese, spices, herbs or use as a decorative item. Crab net design matches the salt and pepper shakers on a dock featured above. 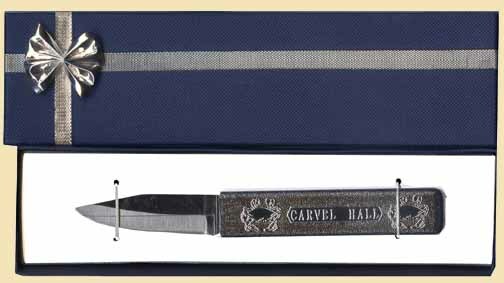 Made by Salisbury Pewter. These handy crab shaped shells are great for cooking crab imperial, crab cakes or other crab dishes, and make a nice presentation for those special occasions. 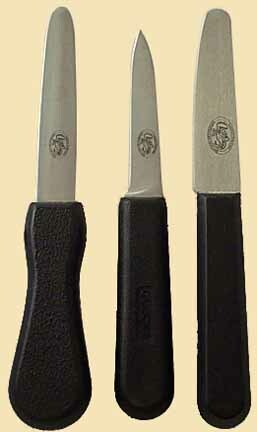 Use them when freezing crab imperial or other crab dishes. 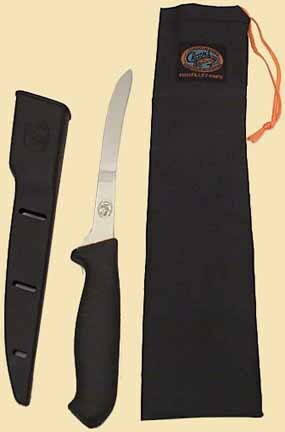 Also great for restaurant or catering use. 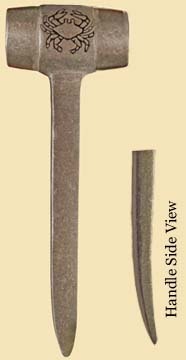 These crab shells are thin and disposable, however it may be possible to use them several times when cleaned and used with care. 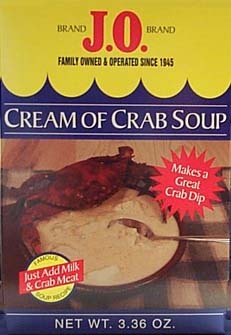 Making delicious Maryland Style Cream of Crab Soup has never been easier! Just add milk and crabmeat and then heat. That's it! Need a great crab dip for your next occasion? Just add milk, crabmeat, cream cheese and white wine and you'll have a dip you and your guests will rave about. Easy directions are on each box. Add some crabmeat and wow what a treat! Serve with crackers or in a hollowed out round of bread. Ingredients: buttermilk, horseradish powder, garlic, chives, onion, parsley, cracked pepper. Free crab dip recipe here. Who doesn't like crab dip? 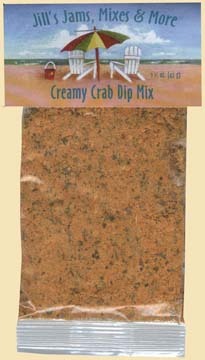 It's easy to make delicious crab dip with this mix. Just add cream cheese, sour cream and crab meat to the mix. Can be served hot or cold. Ingredients: onion, parmesan cheese, cheddar cheese, seafood seasoning, parsley, dry mustard, garlic, celery seed. Avg. wt. 3.4 oz. Approx. 4"x3"
So cute! 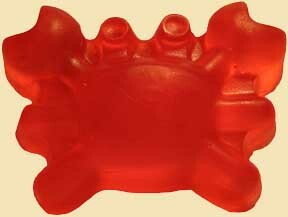 A red crab shaped glycerin soap infused with a mouth watering fruity grape scent! Kids and kids at heart will love the shape and smell! The grape scent is good for cleaning and neutralizing your hands after picking crabs! A must have! Ingredients: Coconut Oil, Palm Oil, Safflower Oil, Glycerin (Kosher, vegetable origin), Purified Water, Sodium Hydroxide (saponifying agent), Sorbitol (moisturizer), Sorbitan Oleate (emulsifier), Soy Bean Protein (conditioner), Fragrance Oil 3%, Mica and/or Cosmetic Safe Glitter. 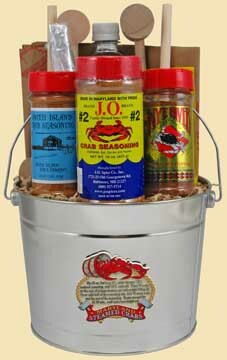 Crab eater's will love this pail filled with products for seasoning, steaming and eating crabs. 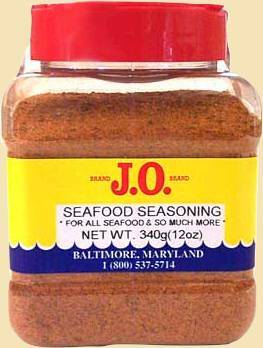 The seasonings are also great for all types of seafood. 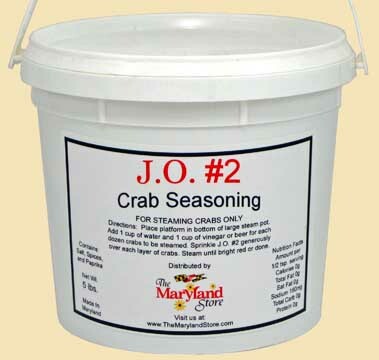 You get JO #2 Crab Seasoning, Wye River Seasoning, Tavern Seafood Seasoning, Apple Cider Vinegar, Old Bay Crab Cake Classic Mix, 4 plastic crab knives, 4 crab mallets, 8 feet of crab paper and a Steamed Crabs Recipe Magnet. 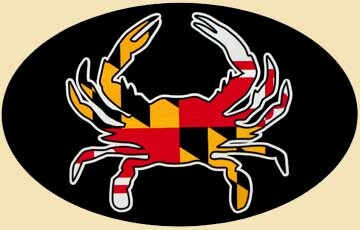 This is a great way to introduce someone to Maryland style crab eating! 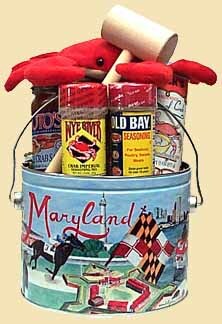 This beautiful lithographed medium Maryland tin featuring scenes of Maryland landmarks and symbols is packed with some of Maryland's crabbiest treats. 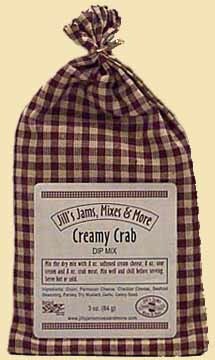 The products included are: Cream of Crab Soup, Crab Salsa, Crab Cake Classic, Crab Imperial Mix, Crab Mallet, Crab Dip Mix, Old Bay Seasoning and a Plush Bean Bag Crab Toy. The products are packed as shown and then shrink-wrapped and finished with a bow.